There are some feature restrictions depending on which versions of Dynamics 365 for Sales and Microsoft Exchange you're running, as detailed in the following table. No features or action cards are available for Exchange, so your Exchange version isn't important. 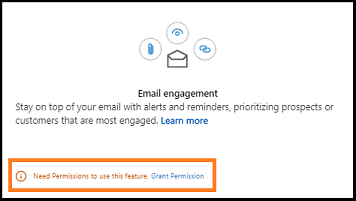 The features Relationship assistant, Email engagement, and Auto capture are available for Dynamics 365 for Customer Engagement for Enterprise license only. As an administrator, you can enable Embedded intelligence for your organization to use features such as Relationship assistant, Email engagement, and Auto capture. Sales AI provides features that track behavior and collect information about contacts. Make sure you understand the related privacy issues that these features raise and enable the features only if you're certain that they don't violate any privacy policies already in place in your organization. Always take steps to protect the privacy of your contacts. Go to Settings > Sales AI. On the Overview tab, select I Accept to accept the privacy statement for Sales AI. Sales AI is enabled for your organization and you can configure features such as Relationship assistant, Email engagement, and Auto capture. To enable cards such as task due today, custom activity due today, and email due today to users in your organization, you can configure Relationship assistant. By enabling this feature, you consent to share data about your customers' email activity with an external system. Data imported from external systems into Dynamics 365 for Sales are subject to our privacy statement. For complete details about each available action card, including details about the configuration settings available for each of them and other details, see Action cards reference. Assign user privileges to give access to the Relationship assistant features. The privileges required to access embedded intelligence features are automatically enabled for all out-of-the-box security roles, but they're initially disabled for all custom roles. If you enable any embedded intelligence features, you must check the settings listed in the following table to help ensure that your users can access those features, and to help ensure that other features don't stop working because of privilege cascades related to these features. Action Card Core Records Gives the ability to view and interact with action cards that are generated by Relationship assistant. Warning: If Relationship assistant is enabled, all users must have a role with read access for this privilege. Because of cascading, users without this privilege will lose access to many Dynamics 365 for Sales features when Relationship assistant is enabled. Action Card User Settings Core Records Gives the ability to view and change user preferences for action cards that are generated by Relationship assistant. Warning: If Relationship assistant is enabled, all users must have a role with read access for this privilege. Because of cascading, users without this privilege will lose access to many Dynamics 365 for Sales features when Relationship assistant is enabled. 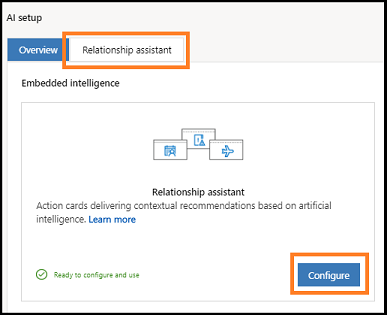 To open the Relationship assistant configuration page, select Configure on the Relationship assistant tile or select the Relationship assistant tab. Cards are categorized by type, such as Base and Advanced. By default, the advanced cards are not enabled. To enable the advanced cards, select the check box in the Advancd Cards section. Enable or disable specific action cards as needed by using the check boxes provided for each card. Some cards have extra configuration settings that modify their behavior. These settings are provided to the right of the check box for only the relevant cards. On top of the page, select Save to save your settings. Enabling the Email engagement helps the user in your organization to receive alerts and reminders that help build customer relationships. If you enable Email engagement, we strongly recommend that you also enable Relationship assistant, because Email engagement relies on some of its features. If the Dynamics 365 for Customer Engagement AI for Sales is installed, this step will be skipped. You don't have to grant permissions to Email engagement. Email engagement is enabled and ready to use in your organization. 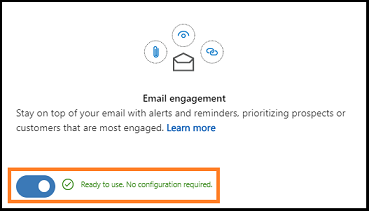 To enable or disable Email engagement, use the Enable toggle key. 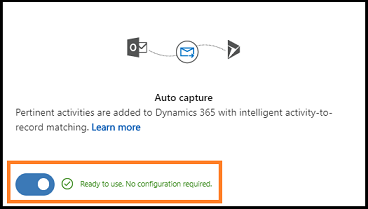 To help users in your organization to automatically add relative activities of their customers to Dynamics 365 for Sales, enable Auto capture. You must use Microsoft Exchange Online as your email server. Users must use the web client for Sales(other front ends aren't supported)]. After you accept the privacy statement for embedded intelligence, Auto capture is enabled by default. If it's not enabled, select the toggle button to enable Auto capture. For specific privacy information about Embedded intelligence, see Privacy notice.